Back-Up Story: "The Origin of Wonder Woman"
Day 1: Black Adam takes Isis to a garden planted by the children of Kahndaq in honor of Isis. There is an empty patch of land reserved for Isis's brother. Black Adam proposes to Isis. Day 6: The Question and Renee Montoya are in Kahndaq and Montoya realizes Intergang is going to hit the wedding. Mary Marvel talks to Isis and expresses her concern that Isis is marrying a murderer. Isis insists Black Adam has changed. Montoya realizes that all the rat poison at the shipping place isn't for rats - it's an anti-coagulant used by suicide bombers. The Marvel Family has come together for the wedding. Cap, Jr. is handling crowd control while Uncle Dudley works on catering. Isis and Adam get married with Captain Marvel officiating. Cap, Mary, Isis, and Adam call "Shazam!" and call down the seven virtues of man. Meanwhile, Montoya spots the suicide bomber who is only a child. She is too far away. There's only one way to stop the bomber - shoot her. And she does. As Isis and Adam consummate their marriage, two maintenance workers scrub the suicide bomber's blood out of the sidewalk. Day 7: Adam Strange, Buddy "Animal Man" Baker, and Starfire blast off the planet's surface. They're (hopefully) heading toward Earth. Back-Up Story: "The Origin of Black Adam"
Teth-Adam is the first recipient of the power of Shazam, becoming Mighty Adam in the 13th Century, B.C. After Adam's wife and kids are killed, he becomes a murderous dictator, is renamed Black Adam by the wizard Shazam, and is banished into a mystic scarab. Several years ago, Theo Adam, a distant descendant of Teth-Adam, finds the scarab and frees Teth's soul. Shazam's modern champion, Captain Marvel, eventually defeats Black Adam. Adam spends some time in the JSA but ultimately returns to Kahndaq as its leader and protector. Main Story - 4: Only FIVE days to plan a wedding? It's good to be the king. I think "52" is a great series. Black Adam's story arc is certainly one of my favorites in the series. I am very curious as to where things are heading and how separate story arcs will continue to meld together as the Montoya and Black Adam stories did so well this issue. One thought: Why doesn't anyone think it strange that there's a man with no face at Black Adam's wedding? Good job with security Freddy. I wish I was enjoying the Adam Strange et al story arc more. This two page add-on of events on Day 7 seems so out of place squeezed in between the Black Adam lead story and the Black Adam back-up story. All it serves to do is remind me of all the other storylines where presumably nothing of consequence happens this entire week. Whatever. Art - 4: The art is beautiful but wouldn't traditional Kahndaquian women be put off by Isis's revealing garb? Backup Story - 3: Maybe it's just me, but I would've guessed that a weekly comic book that relies so heavily on continuity would garner mainly established DC readers. With that in mind, these two page origin stories seem pointless. 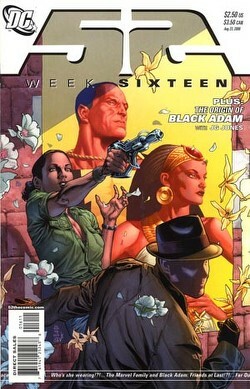 Also, why couldn't Black Adam's "Powers And Weapons" description have been incorporated into the story? All it is is a laundry list. I'd have pulled that out of the separate "Who's Who" style box and expanded the story's second panel to include a stone inscribed with the names of the Egyptian gods and their abilities. But that's just me. Art - 3: The art style mirrors the lead story. Brighter background colors might have created more of a sense that the darkness of Black Adam slices through the DCU (particularly the Shazam corner of the DCU). Cover Art - 3: The Marvel Family comes together so infrequently that it would have been nice to have that moment commemorated on the cover.